Cousin Mary is coming tomorrow for a short visit. I looked for the old photo of the two of us at five years old sitting and fitting into one lawn chair. Her little ankles were crossed very ladylike and my stance? Think Heidi Fleiss age five. My legs couldn’t have been further apart dangling akimbo from the chair. You could have driven an 18 wheeler between my knees. She has tried to bring me some class all our lives. Today she sent me a Chanel wallet which she knows I won’t use. Also, various beautifully wrapped presents arrive throughout the year with jewelry she thinks would look good on me. 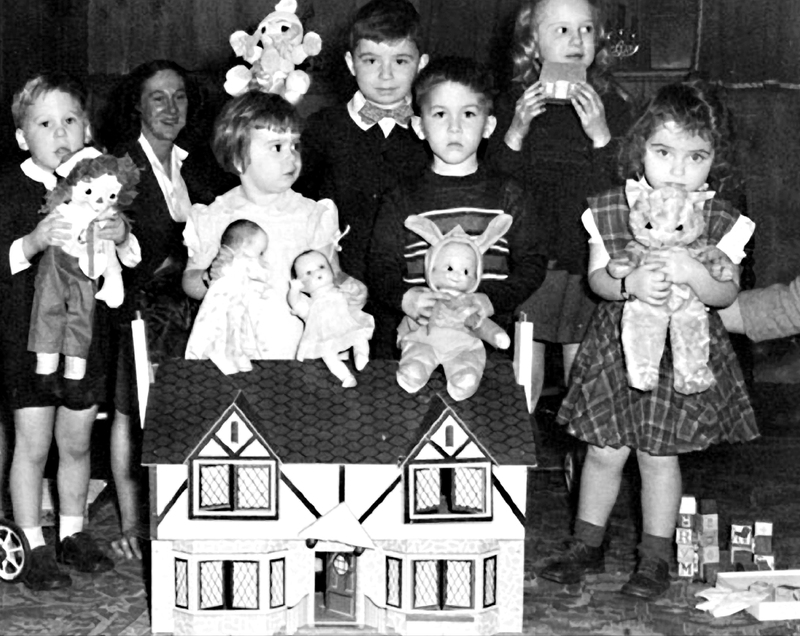 In this photo, the only one I could find, it is her 5th birthday (standing with two dolls looking in my direction (holding some type of stuffed animal, looks like a big cat) and according to her adult interpretation she was keeping an eye on me to make sure I didn’t take any of her birthday presents home. My late brother is center in the back, smiling, with the bowtie. Aww…. She’s my cousin but also one of my best friends. We got over that phase where she thought I was stealing her bling. Now, she sends it to me. “You could have driven an 18 wheeler between my knees.” Nice! A friend of mine drives an 18 wheeler. He has an 18 wheeler between his knees all the time but he does not remind me of Heidi Fleiss. Come to think of it, his last name is Wheeler. How bizarre! Could you please let your cousin know that I am dire need of class help right about now, and that I favor Gucci, Michael Kors, and Comme des Garcons. I live in Texas and therefore need the help more than you do Pat. With all due respect as usual. I’ll email you my address. Gee Pat what are you trying to say? On the surface it looks like you’re saying that you had something in common with a female pimp and you couldn’t keep your legs together. Is this what your trying to say or am I missing something. Please help me understand before my fertile imagination goes berserk. What’s with the big logo thing? Shouldn’t it be a big PC? Or is it a “second” and they cut the back off the “P”? With all due respect as usual, Nat, I think there’s a greater chance that really was Sarah Bernhardt last night on Runway, than you’ll be seeing some Gucci snacks coming your way. She’s still got a lot of work to do right here at my house! Razz…before your imagination goes to far: my reference meant only that my cousin was always very ladylike and seated like a nice little girl and I was sitting or rather draped in the chair with my legs danging but really far apart, not ladylike in other words! It did not foreshadow any relation to the oldest profession! I’m just laughing thinking about that prospect. The logo is the Chanel logo: Two C’s. The founder was Coco Chanel. If the they had a P and a C, no one would give a damn! Even me, I fear. I hate logos all over everything. Razz, you’re a dirty little fart!! I hope you guys have a nice visit. Do take some photos of you two bling shopping . . .
Tysdaddy, I’m not into bling that is what makes this so touching. She takes it upon herself to try to spruce me up! We never go shopping! Ever! She does that for a living (runs a store in Florida and is in NYC now buying for “the season”) so we’ll just go and visit family, sprinkle our fairy dust as lightly as possible and then she’ll go back to NYC. And, don’t be too hard on Raz, cuz I edited this post to make it clearer about the 18 wheeler remark. The original post was a little too, how shall I say, “open to interpretation” by fertile imaginations! I adore that expression, you mind if I clone it? Pat- I can see the little Annie Lennox/Spock child even there at 5 years of age. It’s you. All those treasures that are given to you and yet, as you claim, not you, would they not make a perfect photo montage with yet another challenge of some kind? The practical vs. The fanciful. LLBean is to Chanel, what Pat is to ——-. Since you have no obvious deficiencies in coming up with topics, I’ll stop now. PS- I do miss Spud. I love that idea, BL, but I usually give these things away! Although, I love the practical/fanciful theme? Mmmmm. Me thinks this is the first annual BonnieLuria challenge? In oil, of course. Actually, the first picture I put up on this post was spud and the chanel wallet! I’ll send it to you. Spud vs Chanel is a very good analogue to this cousin relationship! Haha! Love the photo and story. Black and White photos always make things look ancient. I only appeared in color about ’73. I’m sure I had a Raggedy Andy and the black shoes like your partner in crime on the left when I was a kid. Sanity, not sure which expression you are cloning, but go right ahead! PL, I really do not remember the name of the doll which makes me think it might have been one of Marys’ and she was right to keep an eye on me! Aw, you used to like cats :) super cute!